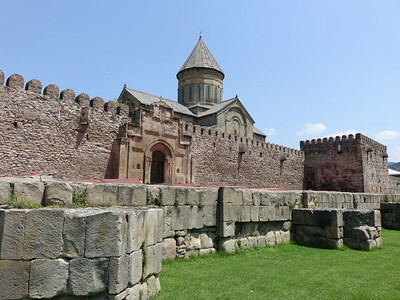 The Historical Monuments of Mtskheta are three medieval religious buildings in the former capital of the East Georgian Kingdom of Kartli. Here Georgians accepted Christianity in 317 and Mtskheta still remains the headquarters of the Georgian Orthodox and Apostolic Church. The Historical Monuments of Mtskheta are all about the Georgian Orthodox Church, celebrating the introduction of Christianity in Georgia in the year 317. Three medieval religious buildings in the ancient capital of Mtskheta were selected to represent different phases in Georgian ecclesiastical architecture: the Jvari Monastery, the Svetitstkhoveli Cathedral and the Samtavro Monastery. Mtskheta is an easy half day trip from the capital Tbilisi by marshrutka. Once you have arrived within the town limits of Mtskheta, you have to pay attention where to exit the bus - the trick is to stay on until you are right in front of the big cathedral, ignoring all the loops it does first around town and across the river. I spent about 3 hours in Mtskheta, including a ride back and forth by taxi to the Jvari monastery on a hill outside the city. The Svetitstkhoveli cathedral towers high above everything in the city. One enters through a large gate, with two bull heads on both sides: these are pagan fertility symbols. The courtyard is very spacious, with a neat lawn that is forbidden to walk on. The outer walls of the cathedral display some interesting reliefs, made out of red stone that stands out against the grey of the rest. In general though, I found the reliefs here in Georgia to be quite simple. It may be a result of local taste or a sign of lack of wealth that decoration is so limited. In comparison to the other churches that I have seen so far in Georgia, the cathedral looks more like an 'ordinary' church. The high elongated nave, which you see in many European churches as well, makes the interior less dark. A very large painted image of Christ looks down on the congregation from above the altar. There is a beautiful iconostasis. Believers light candles in front of the many icons. The Samtavro Monastery lies a 10-minute walk away from the cathedral (stop for lunch at the lovely ladies of Café Guga, which lies en route!). Samtavro is an active nunnery, and I encountered black-dressed nuns sweeping and selling candles. You can also obtain bottles of holy water here. Of the three inscribed monuments in Mtskheta, this is the most religious in character. Important figures from the history of the Georgian Orthodox church are buried here. Jvari monastery balances very nicely on a cliff far above the city. As with all attractions where I have been during my first two days in Georgia, it is very busy here and the parking lot is full with vans and taxis. This monastery dates back to the 6th century, making it the oldest of the three monuments of Mtskheta. It has 4 apses (semicircular niches) which makes it a tetraconch. It is the prototype of many Georgian churches. Inside there is one open space, with a large wooden cross in the middle. 'Jvari' means Monastery of the Cross: already in the 4th century a large wooden cross was placed on top of the hill as a symbol of the victory of Christianity on the pagans. It is precisely on that spot that this church was built. I found 2 of the 3 monuments certainly worth a visit: the cathedral because of its size and wall paintings and the Jvari monastery because of its somewhat mystique atmosphere. They give you a glimpse into the world of the Georgian Orthodox Church, which traditions and religious views for an outsider like me are hard to grasp. This is the site really deserving of inscription. Historical significance of this place justifies its presence on WHS list. Beautiful Svetitskhoveli Cathedral and Jvari are highlights of this site, but it's worth to go for a stroll and see old streets of Mtskheta. The best way to get to this ancient town from Tbilisi is marshrutka: cheap and quite comfortable. I recommend to take a taxi from Mtskheta to see Jvari Monastery. Site visited just recently (July 2013). Mtskheta lies just outside Tbilisi city limits and is easily accessible by local marszrutka (from Didube bus station, quite frequent buses, approximately every 20-30 minutes, the whole journey takes similar time, ticket costs 1 Lari per person). Mtskheta as a town (not more than 5 thousand inhabitants) is a small relaxing place, very quiet comparing to busy (and hot) Tbilisi, there are some private flats for rent (rooms) - full list of them available from local tourist information (just outside Svetitskhoveli Cathedral). It is possible to visit all 3 places (Svetitskhoveli Cathedral, Jvari and Samtawro monasteries) in one day but at least visit to Jvari requires some preparation. It can be reached by foot (ask for details at tourist info spot) or by taxi (count at least 20 Lari for both ways). All 3 places may as far be visited free of charge. I travelled to the Soviet Union in 1990. Georgia was part of the tour and Tblisi was my favourite city to visit, as the people were warm and friendly. We had also been to the hectic city of Moscow beforehand and the slower, peaceful pace of Tblisi was a welcome change. I don't remember much about Mtskheta but I have pictures of the site to prove I was there. But I do remember eating some wonderful hot bread (similar to a baguette) after the tour! Mtskheta is the ancient capital of Georgia and its Cathedral is the “capital” of the Georgian Church and the burial place of Georgian Kings. It only lies around 25kms outside Tblisi and, if you are in the country, should be seen. It is probably best taken in as part of a trip along the Georgian Military road towards Russia. On the other side of the river, and easily accessible if you are coming from Tblisi in your own transport lies the Monastery of Djvari. This provides fine views across the valley to the town and cathedral which dominates it (photo). a. The “Fortress Monastery” at Ananuri – beautifully situated by a lake (the dam which created this reservoir was, we were told, going to flood this church but, even in Soviet times, enough pressure could be brought upon the government to prevent this). It also has fine murals. 2.5: Stanislaw Warwas Solivagant Tony H.
From "City-Museum Reserve of Mtskheta" to "Historical Monuments of Mtskheta"
Medieval buildings with significant 19th century murals: Svetitskhoveli complex: The monumental Pantocrator in the main apse is characteristic of the 11 th century, but was repainted in the 19th century. Writing systems: "Of special significance are early inscriptions, which form a valuable reference in the study of the origins of the early Georgian alphabet." Pompey the Great: AB evaluation " The citadel (Armaz-tsikhe) of Great Mtskheta is located on the side of Bagineti mountain on the right bank of the river Mtkvari". Wiki "Armazi remained the holy city of Iberian paganism (Iberia = Caucasian Iberia, an ancient Georgian Kingdom) and one of the defenses of Mtskheta. The fortress was captured by the Roman general Pompey during his 65 BC campaign against the Iberian king Artag. A ruined structure over the Mtkvari River dates from that time and is still called "Pompey's bridge"." Holy Tunic: Svetiskhoveli Cathedral ("The Living Pillar") is known as the burial site of Christ's khiton. Tradition holds that a Georgian Jew was present at the crucifixion and bought the khiton taking it back to Georgia. Miracles associated with the relic led to the building and naming of the Cathedral. The event is celbrated each Oct 1. Introduction of Christianity: Christianity was brought to Mtskheta in the 4th century by St Nino, and became the official state religion in 334. The first wooden church was built in the palace garden, where the Svetitskhoveli church now stands. Modelled after: A small copy of the Church of the Holy Sepulchre was built in the grounds of Svetiskhoveli Cathedral between the end of the 13th and the beginning the 14th centuries to mark it as the second most sacred place in the world (after the church of Jerusalem), thanks to Christ?s robe. 118 Community Members have visited.